Lieber Charlie, du bist ein wunderschoener Kater! What a handsome boy you are, with your beautiful, soft-looking coat, and your sweet face. You are a kitty with lots of things to do. You like to be outside, being petted by your person and drink water with your paw. And your favorite hiding place is in the wardrobe, so your family always has to make sure not to shut you in! Even with your busy schedule, you still have time to cuddle. Charlie, you are a precious boy, and I wish you and your family a great day full of celebration, and many more happy and healthy years together. Hi Charlie in Simmern, Germany! Happy Cat of the Day! How lucky are we, having a beautiful Tuxie boy as our featured honoree! Just as your young human says, your gorgeous, trademark Tuxie black and white coat looks SO soft, and I can just imagine what a treat it is to cuddle you, to pet your soft coat! How lucky your young human, your entire family is, having known your love and devotion since you were but a mere few months old! The happiness and smiles your bring to their lives is truly a gift to be cherished! You truly are the best cat in the whole wide world, Charlie, just as special as can be, a treasure, and so very deserving of your big day of honor! Thanks for ending my day with a BIG smile, sweetheart! Meeting you this evening has been a real treat! I hope you're enjoying a very special Cat of the Day celebration...napping in your wardrobe, hehe, cuddling with your special human, being loved and pampered to pieces, treated to all your heart desires and more! Lots of love, cuddles and kisses to you, precious Charlie, our very special and most deserving Cat of the Day, EVERY day! Dearest Charlie, what a gorgeous guy you are! You are a beautiful kitty with soft-looking black and white fur and the sweet face with that cute pink nose and the white whiskers and ear-tufts and those lovely big golden eyes. You are so cute in that great photo standing there in the grass with that intent look on your face. I wish I could reach through the screen and across the ocean to Simmern, Germany to pet you! I can't, of course, but I know your loving and beloved special friend will pet you for me . And what a delightful personality you have! You are five years old and have been with your dear family since you were a month old. You like to take up water with your paw and drink it. You also like to hide in the wardrobe, so your people are careful not to shut you inside it! You enjoy being outside. You are also very affectionate, and you love cuddling with your special friend. He/she likes to stroke you and pet you, and you like that too. You both love each other very much, don't you. What a wonderful love-filled home you share! 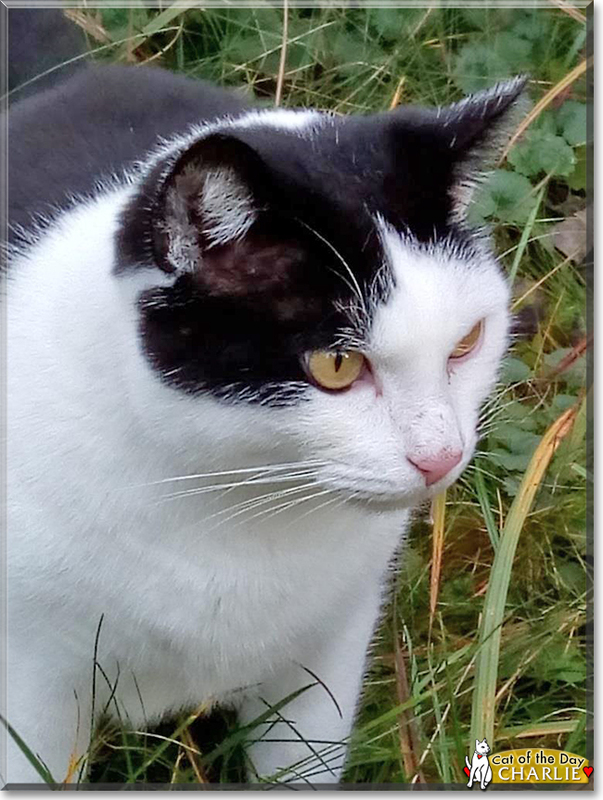 Congratulations, darling Charlie, on being chosen today's Cat of the Day! We hope you and your dear special friend and all your family and friends are enjoying a fine celebration, full of fun and lovies and all your favorite games and treats. Hi, this is Charlie. He is a five-year-old cat. He lives with me and my family, and has since he was a month old. Charlie has black and white hair. I like to stroke him and pet him, and he likes it too. He's so soft! I love Charlie very much. Sometimes he takes water with his paw and drinks it. It's so cute to see. I live with Charlie in Simmern, a little city that is west of Frankfurt in Germany. He likes to hide in the wardrobe, so we have to make sure not to shut him inside it! Also he likes to be outside. Often he likes cuddling with me. He is the best cat in the world for me. Lieber Charlie in Germany! Happy Cat of the Day! What a handsome black and white kitty you are! Just as your person has written, your fur looks so soft to pat! I like your pink nose, too! You like to be outside, and this picture shows you enjoying time outdoors! When you are inside, you sometimes hide in the wardrobe- so your people are careful not to close it while you are in there. You use your paw to take a drink of water. You enjoy being petted and stroked, and you like cuddling! PURR-fect! Happy, happy Cat of the Day to Charlie! Charlie is a fine looking COTD and it is sweet that you love him so much! His coat is lovely, I hope his day is extra special! What a handsome black and white kitty you are Charlie. Congratulations on being COTD!